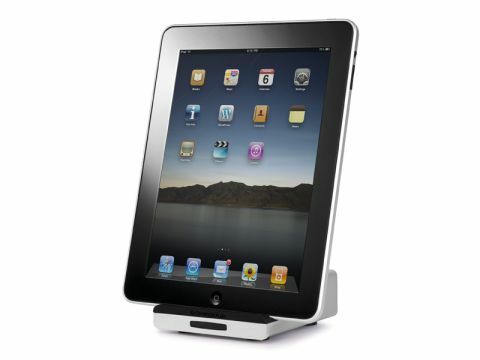 This not a review of the iPad, but the rather neat little digital dock upon which it rests: the Cambridge Audio iD100. The iD100 will operate with various iPods, iPhones and the iPad, from which it will extract a pure digital output that it then delivers to a stand-alone DAC or the digital input on your amplifier (if it has one) for maximum performance. Pure digital out from the iPod/ iPhone/iPad is definitely the way to go for the best sound quality. The digital outputs on the dock include TOSLINK, S/PDIF coaxial, and AES/EBU balanced through an XLR connector. There is also a USB connector to allow your iDevice to communicate with iTunes. As well as this useful audio flexibility, the unit furthermore has a switchable video output so that you can view your stored video content through your TV, courtesy of its composite or component connection. The iD100 comes with rubber adaptors (cushion-like supports) to allow the various Apple devices to connect to the seemingly fragile Apple connector without straining it. The supplied remote control enables you to control, charge and synchronise the iPad – through the USB connection to your computer – while it is connected to the dock. You just need a standard USB 2.0 type A to type B cable for this connection. The last thing you need in a dock, particularly one that can accommodate the relatively large-screen of a £650 iPad, is any instability. The metal-cased iD100 is reassuringly sure-footed even though it is not unduly weighty. The unit comes with a wall-wart switched-mode power supply, which you could swap for a linear supply from a third-party supplier if your system has a particular aversion to these now-ubiquitous devices. Typical of Cambridge Audio products, it almost goes without saying that the iD100 is substantially engineered and offers outstanding performance and versatility for the money. And, of course, the unit works straight out of the box without any undue faffing about, which is what any fan of iGadgets expects these days. We tested the unit feeding the digital input on a Naim UnitiQute through an inexpensive Chord Company Codac digital interconnect. Unlike several iPod docks we have experienced, the musical performance of the iD100 comes as a truly pleasant surprise. Apple Lossless CD rips have solid bass, a rewardingly open and detailed midrange and unexpectedly delicate treble with no 'splash' or emphasis of sibilance. The vocals, in particular, on the Squeeze track Cool for Cats are especially well articulated, as is Glenn Tilbrook's dexterous guitar work on Another Nail in my Heart. Most importantly, the iD100 preserves the dynamics and rhythm of the music and the album rocks exactly the way it should. Similarly, the portrayal of Colin Hay's vocals on his Gathering Mercury album are magnificent, conveying the depth of feeling in his voice on songs such as Send Somebody and Dear Father to the point of listeners becoming visibly moved. Even pop albums from the likes of Adele and country-rock from Jerry Lee Lewis demonstrates that Apple Lossless is a fine file format if you demand music on your iPod with its full quotient of get-up-and-go. MP3s – even those encoded at the highest bit-rate – do not match the performance of ALAC files, but sound more acceptable than usual, nonetheless. For example, Tal Wilkenfeld does not sound as refined as the ALAC version does. There is neither the same detail nor the grip and control evident with the MP3. In short, fill your iTunes library with Apple Lossless music and you will quickly discover that the Cambridge Audio iD100 produces possibly the finest sound you will hear from any iPod dock. Just remember to use a decent digital cable to connect it to your DAC or amplifier. And remember to charge it fully beforehand for the best sound quality.